Hey there readers! Rukan here with my latest archetype review for Celestial Storm. A lot happened since the previous Forbidden Light set review. Rayquaza-GX won all three divisions at the Japan Championships. Meanwhile Tord Reklev took 2nd place at the North American International Championships using a rarely seen Zoroark-GX Control deck. The Celestial Storm set finally brings Rayquaza-GX to our format and introduces a powerful new consistency tool for Zoroark Control decks. These are exciting times, so join me as I take a deep dive into the upcoming set! With no other major events before worlds, the community already shifted focus to Celestial Storm and started producing a bevy of content. So instead of writing a more generalized article on Celestial Storm, I will focus predominantly on Rayquaza-GX. Rayquaza plays differently from other major archetypes in our current Standard format, and I feel like many players misunderstand the strengths, weaknesses, and playstyle of the archetype as a result. I think I have the definitive best way to play Rayquaza for Worlds, and this article explains the how and why. Then I’ll conclude the article with my own thoughts on a potential Worlds Meta and the types of decks worth considering. Before I start talking about my own Rayquaza list, let’s take a look at the Masters division list that won the Japan Championships. Our Standard format differs from the Japanese format. I need to cut the VS Seeker, Oricorio, Shaymin-EX, Sudowoodo, and Hex Maniac. But what other cards do we cut and what do we add? The Celestial Storm set reprints Acro Bike, a powerful consistency tool for Rayquaza-GX. I never feel bad drawing into one of these as a Rayquaza player, because even if the Rayquaza-GX archetype provides explosive early game setups more consistency other archetypes even without the inclusion of Acro Bike, it also flounders more when it whiffs those early setups. But at the end of the day, I need to decide whether any tech cards are worth keeping over Acro Bike. I would happily cut tech cards such as Field Blower or Fighting Fury Belt to make room for them, but would probably keep something like Red Card over Acro Bike. Rayquaza-GX cannot beat Malamar or Buzzwole on its own. It needs some sort of tech to deal with the Prize trade pressure from Buzzwole and the threat of Black Ray GX from Malamar. Fortunately, one tech helps both of these matchups while simultaneously boosting the overall power level of the deck: Garbodor. Garbotoxin reduces damage output from Buzzwole, shuts off their Octillery, sometimes stalls out a Malamar, and provides general utility in nearly every other matchup. Rayquaza itself uses Abilities, but by the time you attach a Float Stone to your Garbodor, you should already have around three Rayquaza-GX on the field. I think Rayquaza / Garbodor takes a different spin on the Garbotoxin variant. 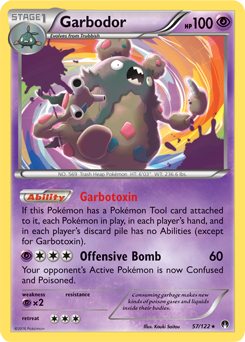 Past Garbotoxin partners such as Espeon-GX, Golisopod-GX, and Zoroark-GX could did not deal enough damage to take big one hit Knock Outs and typically relied on powerful control options played from hand. Rayquaza on the other hand, takes a far more aggressive strategy aiming to dump the entire deck onto the field and discard pile. This both puts the opponent on a much shorter clock and makes the deck far less susceptible to a lategame N than previous Garbotoxin variants. The winning Japanese list ran two copies of Parallel City. But remember that Sky Field exists in the Japanese format, and Zoroark decks run that Stadium almost exclusively. I believe Rayquaza lists needed to run both Sudowoodo and Parallel City to counter Zoroark-GX. Instead, Zoroark archetypes in our Standard format run Parallel City. This discourages the inclusion of Parallel City in our Rayquaza-GX lists. If your opponent plays a Parallel City, you need to hit both Field Blower and Parallel City in order to counter. I don’t think Rayquaza lists have room to tech more than one copy of Field Blower, if any. As a result, I would not include Parallel City at all. I think better tech cards exist for the Buzzwole, Malamar, and Zoroark matchups. I tested Tapu Koko-GX in my games against Buzzwole, Malamar, and Zoroark. It felt terrible in all those matchups, although the least so against Buzzwole. Sky High Claws hits for 130 against baby Buzzwole, and can do so in early turns. The Ability also lets you pull Energy off an injured Rayquaza-GX, making it more difficult for your opponent to lower your total Energy count as well. I would conclude that the winning Japanese list ran Tapu Koko-GX predominantly to swing the mirror in their favor, utilizing the GX attack for either early pressure or to close out a game after losing too many Energy. This card may be worth including for worlds if Rayquaza-GX becomes a significant share of the Worlds meta. If not, I would not bother. When I began testing, Rayquaza-GX took a favorable matchup against Zoroark. The matchup became even when the Zoroark decks included fairy tech cards, such as Tapu Lele and Sylveon-EX. In order to run Tapu Lele, Zoroark decks typically need to include either Unit Energy FDY or Rainbow Energy to pay the attack cost. As a result, this gives Rayquaza-GX the opportunity to cheese some matchups with Xurkitree-GX. And fundamentally, I’m not against the idea cheesing a matchup with a one-of card, especially when Rayquaza-GX runs the Lightning Energy to capitalize on the GX attack in other matchups. But it’s still not hard for Zoroark decks to tech against Xurkitree-GX. For example: Zoroark-GX / Banette-GX can run a single Psychic Energy and Professor Kukui to Knock Out Xurkitree-GX in one attack. And a Zoroark-Control deck could opt to mill you instead of attack at all. So while I probably would not run a Xurkitree-GX into a blind meta, it’s still a tech worth considering. Rayquaza-GX fundamentally needs to bench many GX pokemon to function. Black Ray GX and Shrine of Punishments naturally punish Rayquaza for doing so. This makes Rayquaza particularly vulnerable to spread, so a single Mr. Mime could be worth the slot going into worlds. It’s still a long ways until worlds, and I have not heard much hype for spread archetypes, but it’s far from impossible. I won’t include it from my lists right now, but we should all keep Mr. Mime in the back of our minds. If we remember back to an Expanded event at Dallas earlier this season, a deck won by using Red Card and Hex Maniac. We can employ a similar strategy in Rayquaza-GX / Garbodor by adding Red Card to our list. In my most recent playtesting, I began running three to four copies of Red Card in an attempt to beat Zoroark-GX / Garbodor. And I overall found a slightly positive matchup against Zoroark-GX / Garbodor once I cut copies of Acro Bike to make room for Red Card. Unfortunately, Red Card does not hurt decks like Buzzwole / Lycanroc-GX nearly as much and I found the inclusion also hurt the Buzzwole / Lycanroc-GX matchup. But overall I think the card is worth including to further improve your Zoroark matchups and give the deck a true out to beating the Garbodor variant.